Handmade beaded neckalce with five rosettes created to highlight a boheminan style. The time required for manufacturing the set was approximately 4-4.30 hours of work. Middle rosettes from the sidelines had 2.5cm in diameter. The price is available on request. 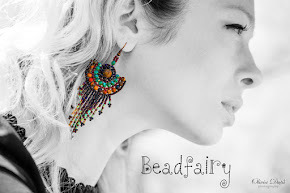 Please e-mail at simona.corlateanu@gmail.com or a Facebook message at Beadfairy Beadwork with the name or the link of the selected product.